When Lizzy heard about the Kha ri Gude literacy programme, she registered without thinking twice. The programme, which means 'Let us learn' in Tshivenda, taught Lizzy and 16 other adults, who never went to school, to read, write and do basic maths. Classes were offered at the Mugidi Primary School in Acornhoek, Limpopo. The programme is offered in all provinces in areas where there is a need. Lizzy made good progress and after attending classes for only a few months, she could read quite well. "I can read my Shangaan Bible without hiccups and soon I will be able to read the English version too," she said. Another eager student, Dickson Mnisi, who is 67 and a security guard at the school, says he loves attending the classes. "When I'm on night shift, I always make sure I catch up with what they learned during the day," he said. "I would recommend this to all people who cannot read or count, because once you learn how to do it you don't have to rely on strangers to help you with things like withdrawing your money at banks." Dickson is also excited because instead of signing his name with an X, he can now write his full name. Kha ri Gude not only empowers illiterate adults, but gives them their right to read and write. The programme has called upon young people with post-graduate qualifications to volunteer as teachers. 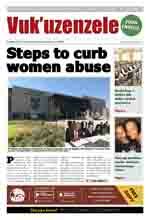 Hearing this, Nkateko Fortunate grabbed the opportunity to use her teaching skills for a good cause. "The students are so willing to learn. There is nothing better than seeing them become independent when they can read and write." 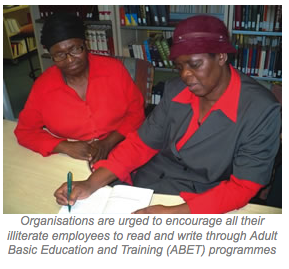 Department of Agriculture has embarked on a drive to encourage all its illiterate employees to read and write, through its Adult Basic Education and Training (ABET) programme. There are more than 200 qualifying employees who are already registered for ABET programmes. Many of them can now sign their names instead of making crosses, and some can read forms that are written in English. Students who complete the programme through to level 4, which is equivalent to the National Qualifications Framework's (NQF) level 1 or Grade 9, qualify to enrol at FET colleges for certificate or diploma programmes. In 2010, 34 people received their level 4 certificates. Mosala Molomo said the ABET initiative had changed his life from nothing to something. He joined the department in 1993 as a general worker and worked as an office assistant. He then completed his ABET level 4. In 2008, he enrolled for an IT technician course and received his NQF level 4 national certificate last year. He is now an IT technician in the department's head office. "It is really never too late to learn and I am not going to stop improving myself," he said.